Me too. Would be even more tempted if they threw either of the Scott bundles into the mix, I think he's the only G2 male they've left out. 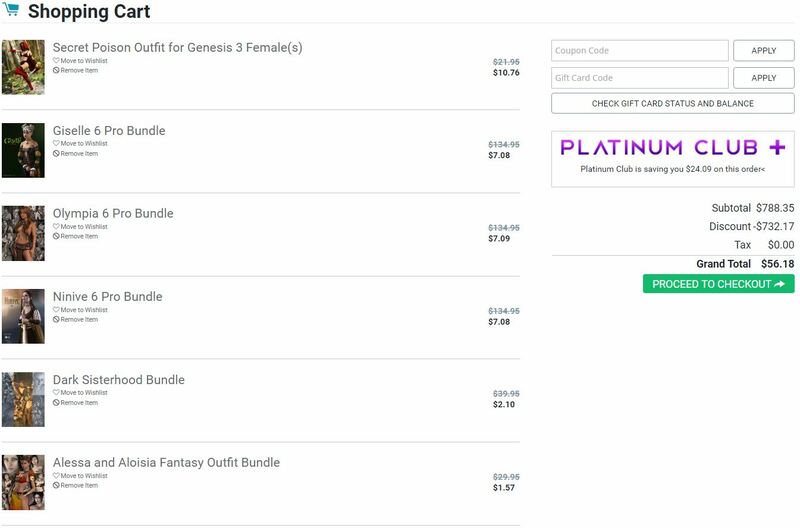 Be careful guys, quite a few items aren't registering with the Genesis 2 sale, in particular some from thewizard3d, the War packs, etc. Basically, anything that isn't at -65/66% (if you're in PC+) on the page is broken. Yeah, PC members with 2 or more pro packs and a new item can get some really great deals with that, if you are looking for G2 stuff. I'm trying to decide if I should bite. I've already blown way too much, but at 28 bucks for pro packages that I do eventually hope to get....it's really hard not to. The PC+ prices are messed up for that sale. A couple of Cute3D's items stack with the Genesis 2 sale... but they're pretty blah items. I'm pretty sure some of the Genesis 2 items where in PC+ and where cheaper BEFORE the sale. Yeah, a lot of the items are broken at the moment. Hopefully they fix it soon. I'm contemplating buying a couple things but won't be buying if they don't fix it. I submitted a ticket around 4 hours ago. Doesn't look like it'll be fixed tonight. Blargh Looks like the broke Cute3D's sale as well - only six of the items in their catalog are showing up at 50-60% off to me. Even though the site - and cart - read discounted prices when I checked out, I was charged the full amount for RDNA and G2 items ($65 instead of $19). Have filed a support ticket with DAZ. CHECK YOUR BANK STATEMENTS, just in case it's a widespread thing. Hmm, it's updating correctly in the cart but doesn't show on the page itself. Weird. That seems to happen a lot of times when a sale is about to end. Oh man! 50% off PerspectX! Ahhhhh That beautiful 50's Diner is crying out for me to own it! lol I actually have nearly half of her/his stuff on my wish list. hahah The promo images look amazing and I'll bet the sets themselves are gorgeous. Actually, I've been looking at that 50s diner by PerspectX. Does anyone have it? And can say if walls and roof can be made invisible to get cameras in? And is it 3delight or iray? 95% off Ninive 6 pro bundle and Giselle 6 pro bundle with purchase... No bad, 2 pro bundles for a little over $7 each. Ninive gets cheaper, but Callie doesn't even though there is a Callie related bundle in the Medival section for her ... I am a sad. are you getting those bundles for $2 cos you purchased a new Fantasy item? 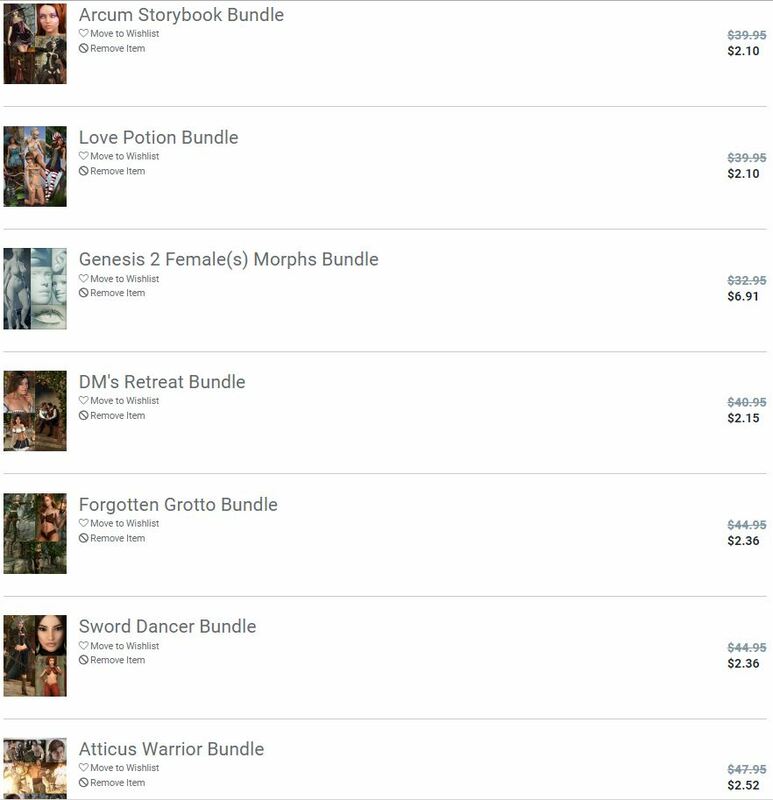 Pick a fantasy new release from today (example the i13 expressions) and then 2+ items that are in both fantasy + gen2 sales.